Everything in Tahoe is more fun with your four-legged furry friend—even grabbing a bite, so to speak. With the Health Department happier if hounds hang outside, many area eateries welcome well-behaved dogs on their decks during warmer months. So grab a leash and your bestie and point for one of these places where pooches get preferential treatment. Ride the gondola for fun from the Village at Northstar up to this all-outdoor five star spot boasting a brick patio, mountain and forest views, a grassy area with lawn games and picnic tables and a menu full of meaty things like St. Louis smoked ribs, brisket and pulled pork, burgers, brats and wood-fired oven-baked pizzas. Canine guests and their guardians overnighting at the property can look forward to plush doggy beds, treats and a water bowl, a dog walking map and pick-up bags. Food Network’s Diners, Drive-ins, and Dives host Guy Fieri likes the bacon-wrapped Kobe meatloaf and crab cake Benedict at this vintage 1948 Pullman diner car along the Old Town Truckee railroad tracks. Pooches give the place two paws up for the patio, water bowls and their own little doggy menu featuring biscuits, beef or chicken jerky, chew sticks and hamburger patty cooked to order. In fact, they will fire just about any menu item you want for your furry friend. Max, a blue-eyed miniature Australian shepherd, and his pal Hammond, a giant schnauzer, are often on hand to welcome patrons to this Brockway Road property where Russ and Joan Jones pour wines produced at the country’s highest, coldest winery. Pick an award-winning pinot noir—or craft beer—from the tasting room in the red barn building, pair it with a charcuterie platter or panini toasted on Truckee Sourdough bread, and head for a table on the grassy lawn or stake out a spot on the bocce court. The annual Peaks and Paws Festival at the Village at Squaw (August 27 this year) is a day full of dog-themed fun like fly ball and fetching contests, guided hikes and pet-related products from cool collars and leashes to pet portraits. Yappy hour (last year Mutt Lynch Wines was on hand) features free dog treats and dollar-off drinks. If you arrive without a furry friend, you need not leave that way: The Humane Society of Truckee-Tahoe, which the event benefits, has lots of dogs looking for their forever home. With its grocery, deli and lakeside deck, this long-running West Shore institution is the perfect spot to bring Spot, who can take a swim near the boat launch. Grab a Harbor Master burrito stuffed with curry-seasoned home fries, sausage, scrambled eggs and Jack cheese, or if it’s lunchtime, try the Kaleb’s Club, which features brown sugar pepper bacon as its not-so-secret ingredient. There’s a large selection of craft beer, and Obexer’s bottles its own brand of sauces, marinades, salsas and dressings so, as they say, you can take something home besides a wet dog. Enjoy a River Rum Punch and burger, and maybe some live music, with your pooch in designated areas of this popular riverside spot. Dogs can take a dip at the rafting take-out area and the lodge offers four pet-friendly rooms. River Ranch rolls out the water bowls and treats when it hosts the annual, and very entertaining, Dogs N’ Duds costume parade and contest, part of the Human Society of Truckee-Tahoe’s yearly fundraiser, this year July 12. Located on a smooth black pebble public beach open to dogs (one of the few in the area) on Carnelian Bay, Waterman’s Landing boasts a waterfront patio where you can start your day with an organic coffee and a Waterman’s breakfast burrito rolled with eggs, cheddar cheese, roasted potatoes and house-made bacon jam. Or maybe grab a Diestel Ranch turkey and Swiss with cran-chai jam. Kayak, paddleboard and canoe rentals make a trip out on the water with your BFF a snap. Hike or bike Tunnel Creek up to the famed Flume Trail, then pick a picnic table for you and your pup to enjoy a breakfast bowl or grilled blue Jack and ham on tandoori naan. The café also offers specials such as butternut squash quesadillas and bison chili, Hood River coffee, Deschutes IPA on tap and treats for your furry pal. Mountain bike Hall of Famer Max Jones runs the place, so rentals, repairs and trailhead shuttles are all top notch. While Captain George Whittell Jr. enjoyed the company of exotic animals like Mingo the elephant and Bill the lion at his Thunderbird estate, donors of certain levels are welcome to bring their dogs to Thunder Thursdays, held weekly from July to September on the well-preserved grounds. Enjoy Lake Tahoe’s shores and sunset along with hors d’oeuvres, wine and beer at the gazebo or old lodge terrace. A variety of artists, entertainers and winemakers are on hand to make each week a unique experience. Dogs rule and humans drool over pies like Walk the Dog, layered with creamy white sauce, chicken, fresh spinach, crispy bacon, garlic and mozzarella. Hair of the Dog piles on pepperoni, sausage, Canadian bacon, green chili, garlic and mozz. Calzones, wings, salads and oven-toasted melted sandwiches are also fetching at this pair of canine-loving locations at Raley’s Village Center at Stateline and Midtown at the corner of Sierra Boulevard and U.S. Highway 50. The pet-friendly Landing Resort & Spa welcomes dogs to its Med-themed restaurant where a lake-view patio features five fire pits and lounge seating. Fido gets a water dish and treat while you perhaps try a Jimmy’s Greek mojito made with ouzo, rum, mint, lemon and ginger, and nibble on kataifi-wrapped feta or wood-grilled baby octopus. 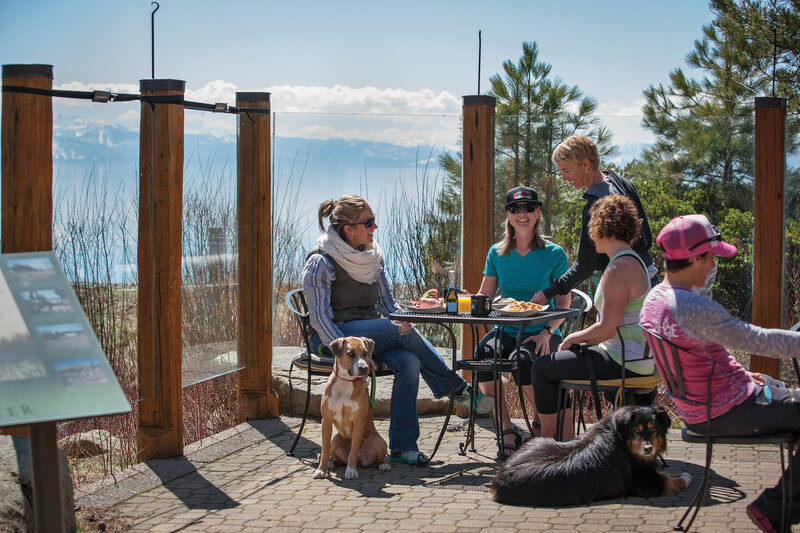 In addition to a stroll through the base village at Heavenly Mountain Resort with a Cold Stone Creamery cone in hand, you can dine with your dog at several restaurants here. Basecamp Pizza, California Burger, Azul Latin Kitchen and Gunbarrel Tavern all offer spacious outdoor seating with heat lamps, fire-pits, blankets and live music on the weekends.